My friend and I gather our materials to vote, grab a snack for what we expect to be a long wait and venture outside. It is my 20th birthday and a fitting time to vote in my first presidential primary. The sun is starting to set and with every minute, we cut it closer to the time the polls close. I look at my two friends, a Parisian and an Israeli, and feel excited to vote with two individuals whose American stories are so different from my own. Until twenty minutes earlier when my French friend Anna asked me to come vote with her, I was unaware she was even an American citizen. On the walk to the Evanston Civic Center, we note that many of our mutual friends who were also unaware of her citizenship are not joining us to vote. The walk to the Civic Center is the same walk as to an off-campus fraternity house that we venture to on sunny days. I point this out to Anna and Inbal, and we laugh, realizing that two of Anna’s most American adventures – a frat party and a presidential vote – happen so near one another. I voted for the first time in the fall of 2014, soon after I left Los Angeles for Northwestern University to begin college. For an American child, voting is expected, awaited and often taken for granted. I grew up in a politically charged home, with dinner conversations notorious among friends for their intensity, so I was ready to finally cast a vote when I turned 18. Voting for the first time was a seminal event, a representation of my transition from child to contributing member of society. For my friend Anna, her first time voting represents her struggle, as one brought up in a foreign land, to function within American society. 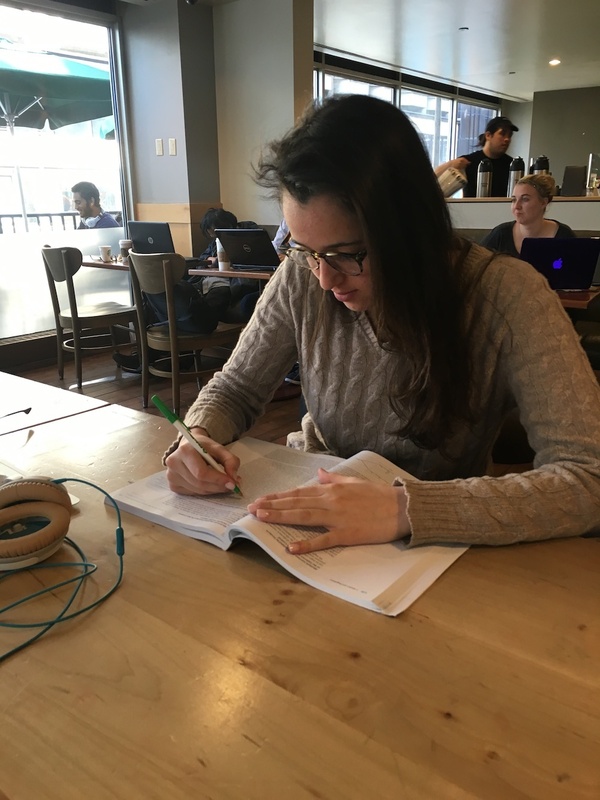 Anna studying biochemistry at a cafe in Chicago. Once she moved to her mother’s home country, Anna enrolled in Northwestern as a pre-med student. The transition to learning “scientific language” in English was a challenge. She felt she was consuming American resources by attending an American university and struggled to reconcile this gift and pay it back in some way. I assumed she was like all my other international friends, a student who had come to America for her studies. Born to an American mother, Anna had always been an American citizen. But she was a proud Parisian. She spoke with an accent, chiding those who pronounced her name incorrectly until finally clucking her tongue and accepting that most Americans would never get it correct. Anna, Inbal and I are all voting in our first presidential election, bringing our different experiences and demographics to the polls. One American, one Israeli and one Parisian. Anna’s immigrant story was a surprise but so was Inbal’s. Inbal sounds Israeli, looks Israeli, argues like an Israeli but is an American. She is the only child to two Israelis, both of whom served in the Israel Defense Forces when they aged into their service years. Inbal often speaks of her heritage and of her dual citizenship. She is proud to be American and proud to be Israeli; both are her birthright. She is American because she was born here and Israeli because her parents are Israeli and, as a Jew, she is entitled to that citizenship. Inbal grew up in America and her stories are at their core American stories. She reminisces about her suburban New York upbringing and of American pleasures like prom and taking the subway to the city. Inbal grew up in a family of immigrants, but is more typically American. When Anna speaks of her heritage, it is about her Parisian self—of her wine and cheese evenings with friends at the Eifel Tower. Her American stories are absent, perhaps explaining my surprise at her citizenship. As we walk to the polling place, Inbal calls her father, a retired Golan Heights army major, to seek his advice. How she votes seems “American,” something that comes easily to her and includes her family, as it does to me. It is not as natural for Anna. As we walk to the polls, I watch Anna retreat into herself. She seems to be contemplating something. She asks me how I’m voting and I respond quickly, confident in my decision. She pauses when I ask the same of her. She takes her decision more seriously than many American young people. Her American citizenship is, in a way, a transaction. Through voting, she fulfills her end of the bargain.